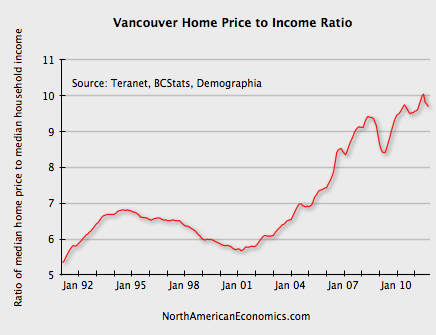 In my previous post from June 2012, I noted that the Vancouver housing market was stalling and mortgage rules had been tightened. I fully expected a housing correction to follow — possibly a major one. What followed was a minor seven month correction of -5.0%, followed by a subsequent gain of 14.9% in the Teranet House Price Index. Considering Vancouver had already been rated the second-least affordable housing market by Demographia, this recovery was hard to understand. As I continued to watch the market, I tried to look for an explanation. Other than the usual housing bubble rationalizations — everyone wants to live here, we’re running out of land, etc. — the conventional wisdom for recent gains seemed to be low interest rates. But even with historically low rates, housing affordability was already near record lows. It doesn’t seem plausible that already-strained households have been able to keep the party going for so long. I also noticed a clear disconnect between the first phase of the bubble (2002-2008) and the second phase (2009-present). 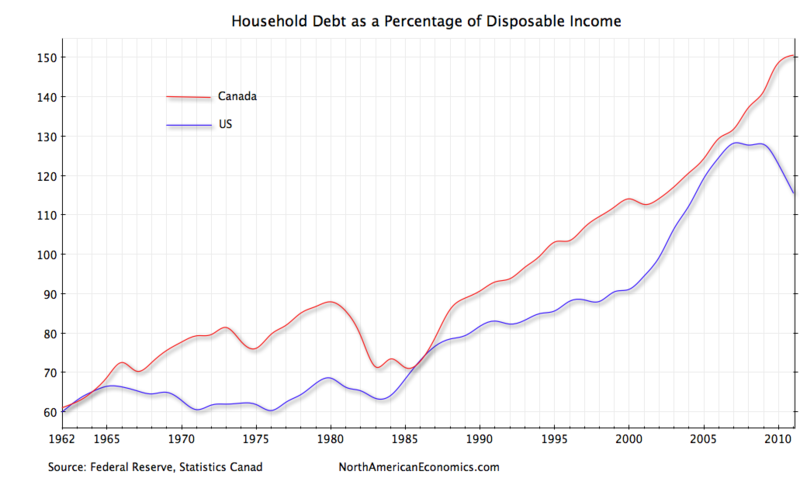 During the first phase, all of the Canadian bubble markets increased in a similar fashion. 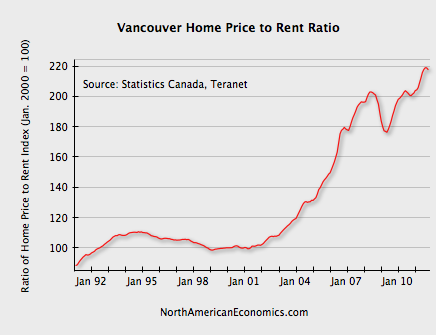 As an example, compare the price history of Victoria and Vancouver. The first peak occurred in mid-2008. Up until then, both markets moved together. 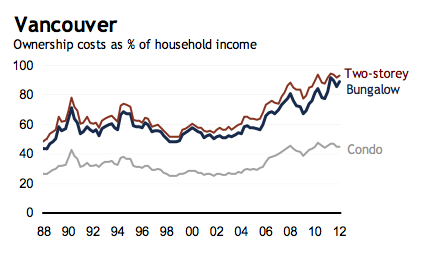 But after the initial recovery in 2009, Vancouver began to behave differently than Victoria and other Canadian markets. Over the last 5-6 years, something very different has been going on here. In my opinion, the difference has been foreign buying — mostly from Mainland China. Unfortunately, there is no hard data on the amount of foreign ownership, so I’ve had to base my opinion on the excellent work of Ian Young, Andy Yan and others. But after years of listening to claims that foreign buying is too insignificant to drive a market as big as Vancouver, I think I’ve found definitive proof. When housing markets are driven by easy financing and low mortgage rates, appreciation is higher for low-end, entry-level homes than it is for more expensive homes. Entry-level buyers are much more likely to max-out on debt than older, wealthier homeowners. This was the case in US bubble markets. For example, look at San Diego. 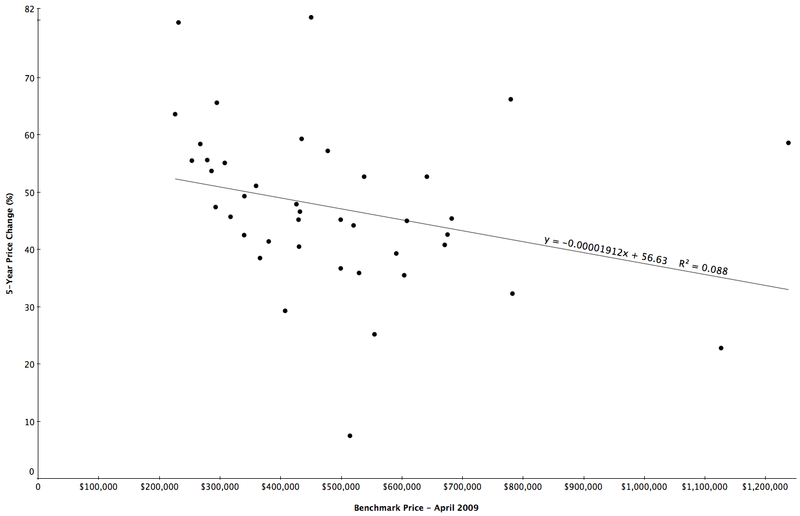 Low-priced homes increased much more than high-priced properties. This was also true during the first phase of the Vancouver bubble. 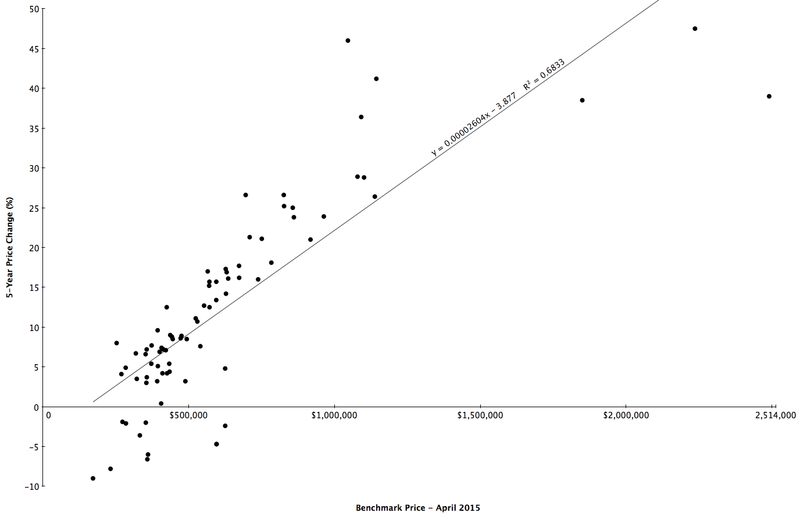 Here is a scatter-plot generated from the April 2009 REBGV Stats Package, showing 5-year appreciation by price. It’s clear that lower priced properties appreciated more. I then created the same plot using data from the most recent Stats Package, and the results are pretty startling. High-priced homes have appreciated much more than less expensive properties over the last 5 years. I can’t think of any realistic scenario where local Vancouverites were able to send this bubble into overdrive with the help of lower mortgage rates — especially when you consider CMHC no longer insures mortgages on homes sold for more than $1 million. The only plausible reason I have been able to come up with is that foreign buying is now the primary driver of the Vancouver housing bubble. So says Bill McBride, author of Calculated Risk. In my opinion, his blog is the single best source for information on the US housing market. I’ve followed his blog for years, and can’t think of a single time he’s been wrong. First there are two bottoms for housing. The first is for new home sales, housing starts and residential investment. The second bottom is for prices. Sometimes these bottoms can happen years apart. For the economy and jobs, the bottom for housing starts and new home sales is more important than the bottom for prices. However individual homeowners and potential home buyers are naturally more interested in prices. So when we discuss a “bottom” for housing, we need to be clear on what we mean. For new home sales and housing starts, it appears the bottom is in, and I expect an increase in both starts and sales in 2012. And it now appears we can look for the bottom in prices. 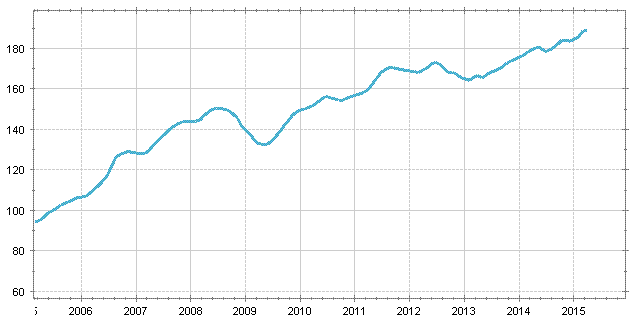 My guess is that nominal house prices, using the national repeat sales indexes and not seasonally adjusted, will bottom in March 2012. 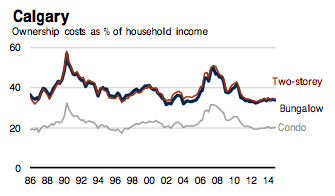 There are several reasons I think that house prices are close to a bottom. First prices are close to normal looking at the price-to-rent ratio and real prices. Second the large decline in listed inventory means less downward pressure on house prices, and third, I think that several policy initiatives will lessen the pressure from distressed sales (the probable mortgage settlement, the HARP refinance program, and more). Of course these are national price indexes and there will be significant variability across the country. Areas with a large backlog of distressed properties – especially some states with a judicial foreclosure process – will probably see further price declines. And this doesn’t mean prices will increase significantly any time soon. Usually towards the end of a housing bust, nominal prices mostly move sideways for a few years, and real prices (adjusted for inflation) could even decline for another 2 or 3 years. But most homeowners and home buyers focus on nominal prices and there is reasonable chance that the bottom is here. 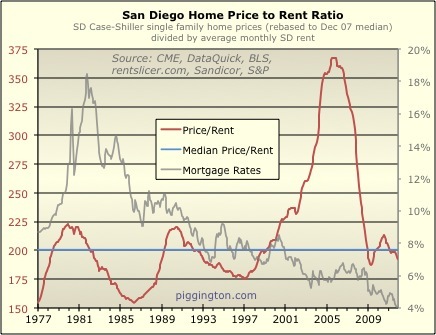 Writing about the San Diego housing market, Rich Toscano at Piggington’s Econo-Almanac has a great explanation of the historical relationships between house prices, incomes and rents. Longtime readers know that I consider the price ratios to be absolutely fundamental to determining whether housing is fairly valued. It makes intuitive sense that home prices would tend to track incomes and rents: incomes, because they determine how much money people have available to pay for housing; and rents, because rent prices reflect how much San Diegans are willing and able to pay to put roofs over their heads when there is no speculative or investment element involved. The historical record bears out this intuitive logic, as San Diego’s home price-to-income and price-to-rent ratios have tended to be strongly mean-reverting over time. 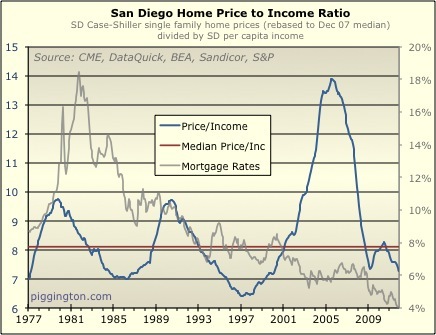 He includes the following two graphs showing how San Diego’s ratios are now back to normal levels after the bursting of the housing bubble. The San Diego ratios were calculated with slightly different data, so the absolute numbers aren’t the same as Vancouver’s. 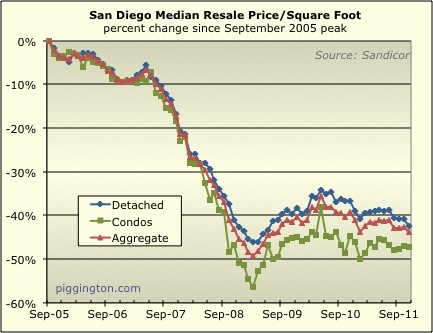 However, today’s deviation from historical averages in Vancouver are comparable with the situation in San Diego in 2005. By now most people have heard about rising income inequality in the US. Looking at the data, it’s clear that the people at the top have done much better than the middle class in recent decades. Between 1979 and 2007, inflation adjusted after-tax incomes for the bottom fifth of Americans have increased 16%. 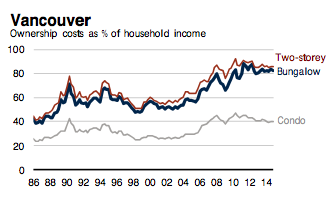 For the middle fifth, income gains have been slightly higher at 25%. 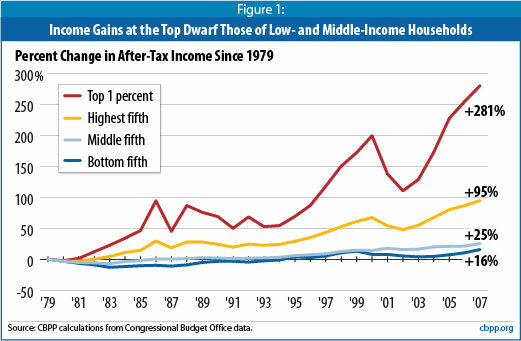 But for the top fifth (and especially the top 1%) the gains have been dramatically higher. How did this happen? 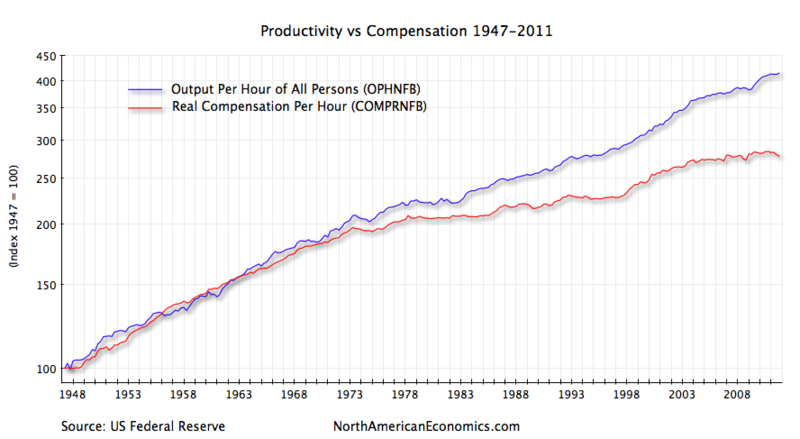 The US Federal Reserve keeps data going back to 1947 for American productivity and compensation. Between 1947 and the early 1970’s, worker compensation kept pace with increases in productivity. Beginning in the 1970’s, however, the average worker began to fall behind. The latest figures show that worker compensation is now 33% lower than it would have been – had it kept pace with productivity. Where did that 33% go? Returning to the income differences between 1979 and 2007, we can calculate what incomes would have been without the increase in income inequality. Doing this, we find that incomes for middle and lower income households would be between 23% and 34% higher than they are now – roughly in line with the gap between compensation and productivity. It seems that a large part of income inequality can be explained by the people at the top receiving most of the productivity gains since the 1970’s. The exchange rate between the US and Canada has varied widely over the last few decades. 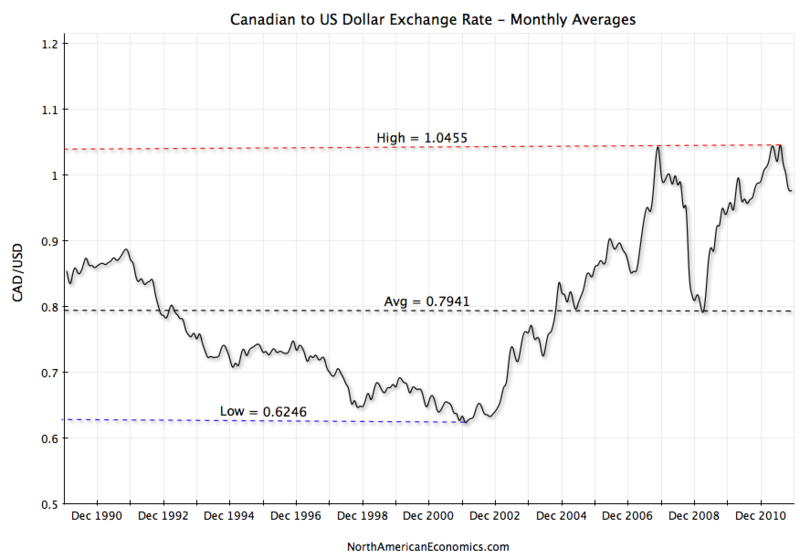 Looking at monthly averages since 1990, the Canadian dollar has ranged from a low of 62 cents in February 2002 to a high of $1.04 in July 2011 with the average over the 22 year period being 79 cents. Is there any way to determine what this rate should be in order to know when the time is right for cross-border investing? As Warren Buffett says, “Price is what you pay. Value is what you get.” The current exchange rate reflects the relative price of the two currencies. The goods and services each currency can buy reflects their values. As with all assets, when the price of a currency is low relative to its value, it’s a good time to buy. But how do you determine the value of a currency? One of the most popular ways is by using Purchasing Power Parity (PPP). PPP is an attempt to calculate the exchange rate which results in equal buying power for each currency. For example, if a basket of goods costs $100 CAD in Canada and that same basket of goods costs $85 USD in the United States, both currencies will have the same purchasing power with an exchange rate of $1.0 CAD per $0.85 USD. In this situation, if the actual exchange rate were $1.0 CAD per $1.0 USD, then the Canadian dollar would buy 17.6% more than the US dollar – implying that the CAD is 17.6% overvalued. Each month, the Organization of Economic Cooperation and Development (OECD) calculates PPP for each of the OECD countries. Their latest data indicate the current exchange rate should be $1.0 CAD per $0.78 USD – coincidentally this is almost the same as the average exchange rate since 1990. At the time of this writing, the actual exchange rate is $1.0 CAD per $0.97 USD implying the Canadian dollar is 24% overvalued. Although there are different methodologies for computing PPP and no method is completely accurate, 24% is significant. Additionally, since the current value of the CAD is also 23% above its 22-year average, it’s safe to say it’s a good time for Canadians to be buying US assets – and a good time for Americans to be selling Canadian.